(PantherMedia / Werner Heiber) Painful or stiff joints and a crunching sensation in the joints are typical signs of osteoarthritis, often also called "degenerative joint disease." Lots of people have joint problems as they get older, and some already have problems in middle age. If symptoms get worse, they can severely limit mobility. Osteoarthritis can affect every joint, but it is most common in the knee, hip or spine. Joint stiffness is often the first sign of osteoarthritis. It is especially severe after long periods of rest, for example when getting up in the morning. Other symptoms include tension in the joints and difficulty moving around. Someone with osteoarthritis may also be sensitive to dampness or cold, or to changes in the weather. At first, the joints are only painful during specific movements or after particularly strenuous activity. As osteoarthritis develops, the pain becomes more frequent because the joint can become inflamed. The affected joints then typically swell up. We need our joints to work for several decades, but many people begin to notice wear and tear over the years. So the older we get, the greater the risk is of developing osteoarthritis. The bones in our joints are covered with very tough cartilage tissue. Cartilage is made of special cells that can repair themselves to a certain extent throughout our lives. But if the wear is too great the cartilage layer becomes thinner and rougher over time. Cartilage fibers can then break away and end up floating around in the fluid inside the joint. In very advanced osteoarthritis, the cartilage on one side of the joint can wear away completely, leaving the bone exposed. Everybody's joints experience normal wear over the course of their lives. But this wear can be accelerated by certain factors, including repeated excessive strain from sports or work. For example, people who have jobs where they need to kneel or squat a lot or lift and carry heavy things are more at risk of osteoarthritis. An injury of the joint can also speed up wear and lead to early osteoarthritis. Being very overweight puts added strain on the joints, especially on the knees. People who have a BMI over 30 are considered to be very overweight (obese). Osteoarthritis is the most common joint disease. It affects the knee, hip and spinal joints the most. The shoulder and finger joints can also be affected by osteoarthritis. Women are more often affected than men. 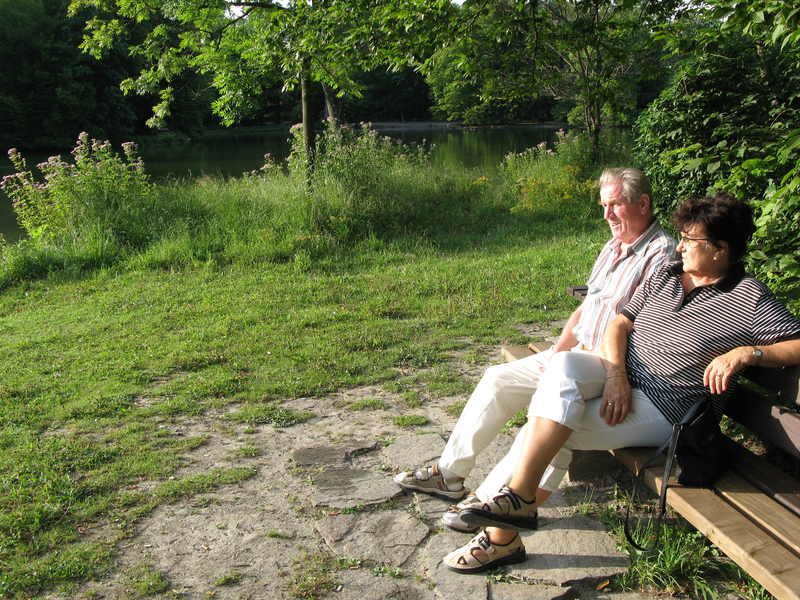 There are no exact figures on how many people have osteoarthritis in Germany. It is estimated that 2 out of 100 people aged between 18 and 29 are affected. The risk increases with age. Among 70 to 79-year-olds, about half of all women and a third of all men are believed to have osteoarthritis. Osteoarthritis is a chronic disease that cannot be fully prevented, and which gets worse over time. If you have joint pain all the time or on and off, you might try protecting the joint and avoiding physical exercise. But too little physical exercise can make osteoarthritis worse: If a joint is not moved, the muscles get weaker, restricting movement even more. Weak muscles around the affected joint are another risk factor for osteoarthritis getting worse. Many people believe that too much exercise causes the joints to wear down, but lack of exercise is actually even worse for the joints. That is especially true for the knee joint. 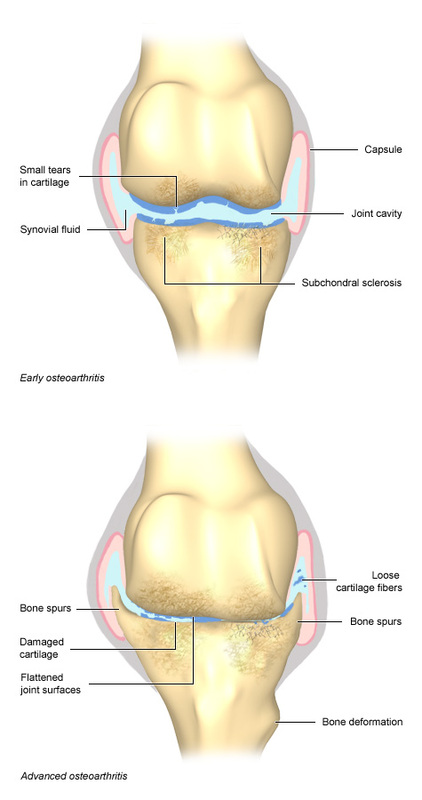 In advanced osteoarthritis, the bones in the joint also change. That may cause the bones to become jagged at the edges, a condition referred to as bone spurs (osteophytes). Osteophytes can severely restrict the joint's movement, which can lead to permanent pain. At this advanced stage the joints may also cause audible noises, for example if the bones rub right against each other. There are many different suggestions and recommendations for treating osteoarthritis, but so far no cure. Most treatments aim to at least slow down the development of osteoarthritis and relieve the symptoms so that daily life is affected as little as possible. There are two different types of therapies: Surgical and non-surgical. Non-surgical therapies include painkillers, exercise and weight loss, for example. Obese people with osteoarthritis of the knee or hip are often advised to lose weight. Studies indicate that weight loss can be helpful if it is combined with exercise therapy. The question of which therapies can improve mobility and relieve pain also depends on the joint that is affected. For example, therapy involving aerobics or muscle-strengthening exercises could help people with knee osteoarthritis. Other treatment options include massage, acupuncture, TENS, medicinal baths or orthopedic insoles. Surgery options for osteoarthritis of the knee include smoothing the cartilage (arthroscopy). But in many cases people who have had an arthroscopy to smooth out their knee cartilage experience pain and difficulties just as often as those who do not have an operation. There are other surgical therapy options available for people with advanced osteoarthritis. For example, a knee or hip joint can be replaced fully or in part with an artificial joint (called an endoprosthesis). Can lavage and debridement help with osteoarthritis of the knee? Bartels EM, Juhl CB, Christensen R, Hagen KB, Danneskiold-Samsøe B, Dagfinrud H et al. Aquatic exercise for the treatment of knee and hip osteoarthritis. Cochrane Database Sys Rev 2016; (3): CD005523. Chard J, Smith C, Lohmander S, Scott D. Osteoarthritis of the hip. Clinical Evidence 2006; 11: 1122. Christensen R, Bartels EM, Astrup A, Bliddal H. Effect of weight reduction in obese patients diagnosed with knee osteoarthritis: a systematic review and meta-analysis. Ann Rheum Dis 2007; 66(4): 433-439. Jamtvedt G, Dahm KT, Christie A, Moe RH et al. Physical therapy interventions for patients with osteoarthritis of the knee: an overview of systematic reviews. Phys Ther 2008; 88(1): 123-136. Pham T, Fransen M, Ravaud P, Dougados M, Ottawa Methods Group. Osteoarthritis. In: Tugwell P, Shea B, Boers M, Brooks P et al. Evidence-based Rheumatology. London: BMJ Books. 2004: 141-169. Pisters MF, Veenhof C, van Meeteren NL, Ostelo RW et al. Long-term effectiveness of exercise therapy in patients with osteoarthritis of the hip or knee: a systematic review. Arthritis Rheum 2007; 57(7): 1245-1253. Robert Koch-Institut (RKI). Arthrose. Berlin: RKI; 2013. Scott D, Kowalczyk A. Osteoarthritis of the knee. Clinical Evidence 2007; 12: 1121.